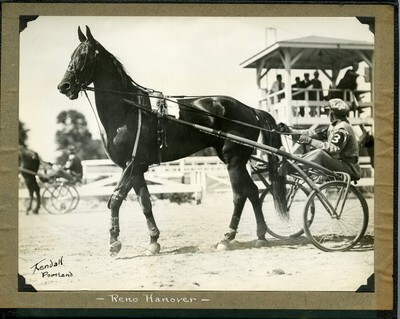 Black and white photo of brown gelding, Reno Hanover driven by H. Goodhart, wearing number 3 in the 2.17 Class Trot of the July 15, 1932 Mohawk Circuit races at Topsfield Fair, Topsfield, Massachusetts. Note the Reno Hanover is outfitted with protective knee and shin guards as well as rubber boots over his hooves. The judges' stand is visible in the background. Guy Kendall signed the photo in the lower left corner of the print photo.